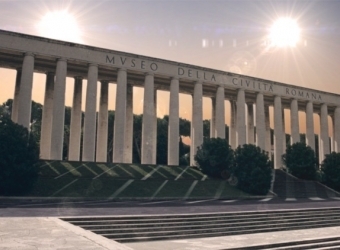 Sean Kelly Gallery is delighted to announce SoundFossil, a solo exhibition of new work by Laurent Grasso and his first in New York since joining the gallery. The opening will take place Friday, September 10th from 6-8pm. The artist will be present. 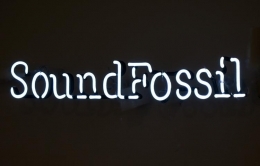 The title of the exhibition references the seemingly impossible contemporary mythology of “sound fossils:” random recordings of sound vibrations located in objects like pottery or stone. 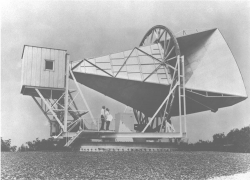 Alternately, in 1964, astronomers Arno Penzias and Robert Wilson discovered a radio frequency remnant supposedly from the Big Bang while using a microwave receiver known as the Horn Antenna. 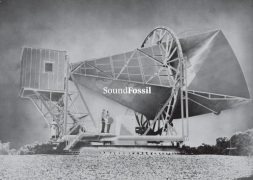 Grasso’s model of the Horn Antenna, which will be included in the exhibition, makes a connection between the sound fossil mythology and the scientific discovery by the two scientists. This intersection of theoretical hypotheses and fact-based science is the thematic focus of the exhibition. 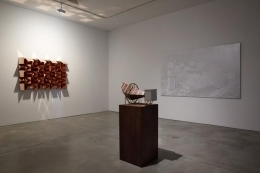 The main gallery will house the monumental Horn Perspective that won Grasso the Marcel Duchamp Prize in 2008 and was later exhibited at the Centre Pompidou in 2009. 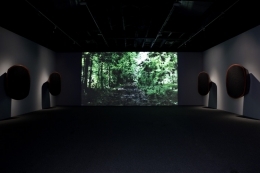 Horn Perspective is an installation that includes a large-scale projection of a looped 35mm film of a tracking shot along a forest path in which an undefined black swarm moves over and around the camera’s viewpoint. The film’s soundtrack will be heard via large wood and brass speakers that will be installed on the gallery walls. 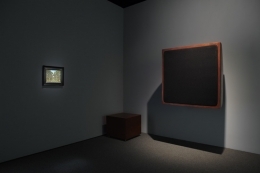 Though the speakers appear to be equipment from a 19th century laboratory, like many of Grasso’s works, their exact origins are unclear. 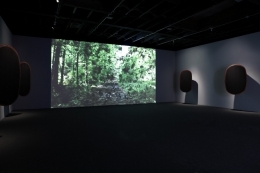 A provocative new work that will be shown in gallery two resembles an anechoic wall, a device used in modern technology to trap sound reverberation. The sculpture is crafted from copper, a material commonly associated with its superb conductive capabilities. 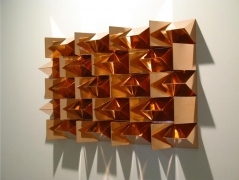 Grasso’s anechoic wall references not just the absorption and/or reflection of sound, but light as well. 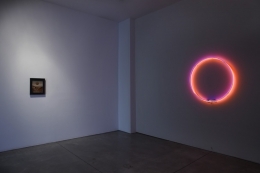 This interest in light is further explored in the neon works in the exhibition, including the dual-colored Eclipse, which will be installed in gallery one. 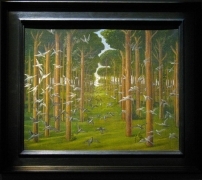 In the words of critic and art historian Arnauld Pierre, “Grasso’s works reflect a recovered ability to travel along temporal lines whose interchanges and intricacies are all stages of a voyage that he defines as a ‘projection of the past toward the future.’” The context of the works is often undefined, making it difficult for the viewer to completely and accurately locate references. 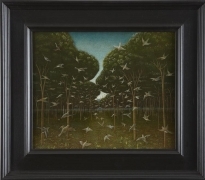 The works’ retro-futurist aesthetic has an inherently surreal quality that is intentionally mysterious and unsettling. 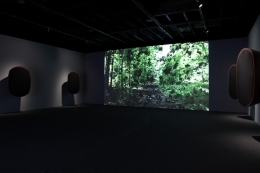 As viewers lose their conceptual bearings they are required to reconsider their line of thought in order to embrace Grasso’s unique ambiguous reality: a reality that merges art, fiction, science and technology. 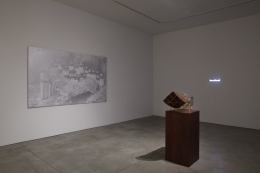 This focus on ambiguous realities caused by shifting temporal landscapes was also explored in the gallery’s critically acclaimed summer group exhibition, memories of the future, which was curated by Grasso. 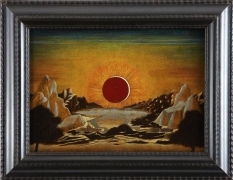 He is the subject of a major monograph – Laurent Grasso: The Black-Body Radiation– published by les presses du réel. 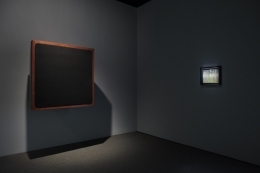 Recent solo exhibitions have included The Horn Perspective at the Centre Pompidou, Paris, and Reflections Belong to the Past at the Kunstverein Arnsberg, Germany, both in 2009. Grasso’s US public art debut, Infinite Light, was installed on the exterior of the Hunter College Lexington Avenue pedestrian walkway in New York in 2008. His acclaimed Nomiya project – installed on the roof of the Palais de Tokyo, Paris in 2009 – has now been extended through the end of June 2011 (www.nomiya.org). 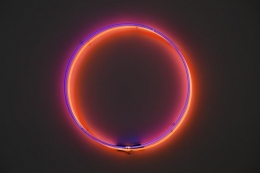 Grasso’s large-scale neon, memories of the future, will be the title work of an upcoming exhibition at the Samsung Museum in Seoul, Korea, opening on August 24th. 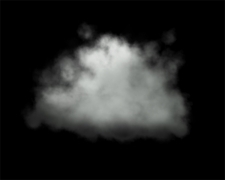 He will participate in Manifesta 8, the European biennial of contemporary art, opening on October 9th. The School of Visual Art's yearly lecture and performance series will begin with a lecture by Grasso in which he will discuss his artistic practice and his exhibition at the gallery. 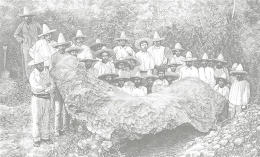 The lecture will take place on September 14th at 7pm in the SVA Amphitheater at 209 East 23rd Street on the 3rd floor. The event is free and open to the public and was organized by independent curator Béatrice Gross and the MFA Photography, Video and Related Media Department of the SVA. For further information, contact: mfaphoto@sva.edu. 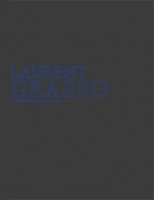 Additionally, an interview with Grasso will be featured on the homepage of Art International Radio at ARTonAIR.org for the week beginning September 20 and will remain permanently available on demand in their archive.